Hemp is no longer considered a controlled substance in the eyes of the Texas Department of State Health Services, which removed hemp from its list of Schedule 1 drugs Friday to bring the state in line with federal law. DSHS announced the decision in a March 13 letter to an attorney representing the U.S. Hemp Roundtable which reached out to DSHS Commissioner Dr. John Hellerstedt following the passage of the 2018 U.S. Farm Bill. That bill removed hemp from the U.S. Drug Enforcement Administration’s list of Schedule 1 drugs. These drugs have a high potential for abuse and no medical use, and include heroin, cocaine, LSD and marijuana. Jonathan Miller, the Kentucky-based attorney representing the hemp industry association, said the move comes because a provision in Texas statute requires the state to follow suit if there is a federal de-classification of a drug. 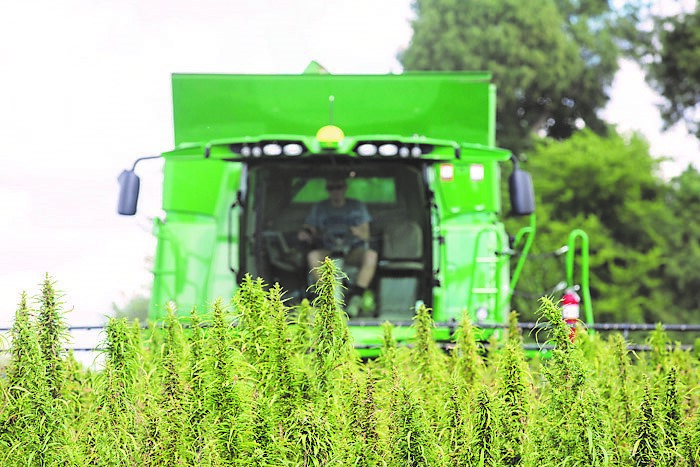 While considered a win for cannabis advocates and retailers in the state, DSHS’ decision does not provide clarity on whether hemp products are legal to sell, purchase and use. “It looks like the state is moving toward conforming state law and practices with the federal law status of hemp, so that’s encouraging, but there’s still some confusion given the disparate laws on the books in the state versus the federal law,” Edinburg City Attorney Omar Ochoa said. Federal law defines hemp as cannabis with less than 0.3% THC, the psychoactive compound that produces a high in marijuana, another cannabis variety with higher levels of THC. But in Texas, all forms of cannabis are illegal unless someone qualifies for the state’s Compassionate Use Program, which allows patients with unmanageable epilepsy and two doctor’s prescriptions to buy cannabis-based products with up to 0.5% THC. In recent years, however, shops have opened up across the state, including in the Rio Grande Valley, selling cannabidiol (CBD) products such as oils, creams and candies that are extracted from hemp. Daniel Brooke, who opened The CBD store in October 2018 — the first store in McAllen selling exclusively CBD products — believes it’s legal to sell and use his products because they contain no THC or less than 0.3% THC and are all derived from hemp. But in order to clear up confusion among law enforcement, attorneys, retailers and consumers, Texas lawmakers must pass legislation actually legalizing hemp, said Katharine Harris, a Glassell fellow in drug policy at Rice University’s Baker Institute for Public Policy. “My understanding is at this time hemp-derived products are not exactly legal in the state and we would need a law to change that,” Harris said. In the interim, it’s up to the discretion of district attorneys whether they will prosecute cases involving possession of hemp products. Locally, the Hidalgo County District Attorney has said his understanding of state law is that any percentage of THC in CBD products, whether derived from hemp or marijuana, is illegal unless someone is covered by the Compassionate Use Program. For this reason, Ochoa, the city attorney for Edinburg, sought a formal opinion from Texas Attorney General Ken Paxton as to the legality of CBD products containing less than 0.3% THC. Because a city attorney is not an authorized requestor, state Rep. Terry Canales, D-Edinburg, will be sending the request on the city’s behalf. Legal clarity, however, could come sooner than an AG opinion, which could take months if not years. State Rep. Tracy King, D-Batesville, filed a bill this session that would legalize hemp-derived products containing less than 0.3% THC. During a committee hearing Monday, nearly two dozen people testified in support of the bill and calling for an end to the confusion surrounding CBD products; no one spoke against it. The committee took no action Monday, but King said he is optimistic it will move out of the Texas House Agriculture and Livestock Committee to the full House for a vote.